I say a lot that EDH finance is MTG Finance on easy mode and for the most part, that’s true. EDH is predictable, moves slowly, moves dependably and while it’s tough to quantify, we’ve found that looking at subsections of the available data can prove to be a fairly reliable model of the overall demand in the format. Demand isn’t all created equal and when we talk about cards that are in the Top 100 EDH cards by color, sometimes the scale can vary by a zero or two between “staples” if you’re determining which cards are in the Top 100 in terms of percentage of eligible decks rather than the raw number of total decks. It’s good to determine what is a staple in certain decks by disallowing ineligible decks – is Eternal Witness not a green staple because it’s not in any Ayli, Eternal Pilgrim decks? 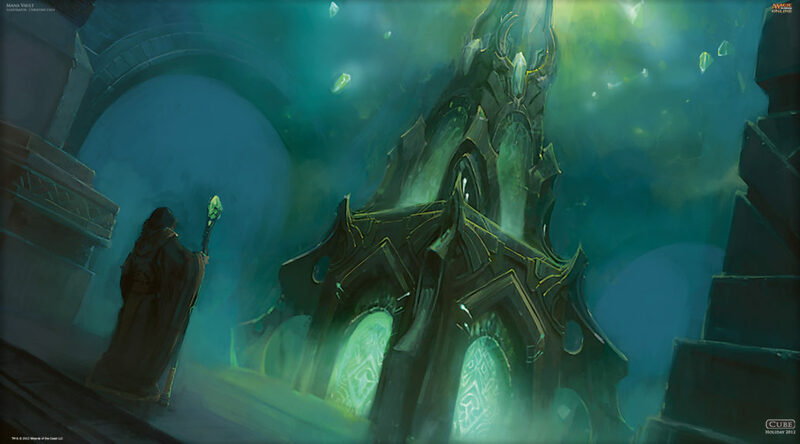 Of course not – Eternal Witness is in a full 42% of decks containing Green on EDHREC and that’s absurdly high. Shouldn’t we rank a card that’s in 42% of all eligible decks higher than a card that’s in 33% of all eligible decks? 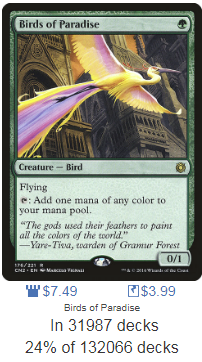 We should – Eternal Witness is more of a Green staple than that card is a “whatever color it is” staple and I’m not suggesting we change that. What I am suggesting is to remember that you need to weight raw demand in your calculation as well. That’s something I do when making a determination. If you’re not, you should start, and here’s why. By scale here, I mean the difference between a color staple and a format staple and how they can vary wildly. When you rank based on percentage of eligible decks, you’ll get Eternal Witness in 5th place and Cultivate in 4th place. You should – they are in an incredibly high percentage of Green decks. 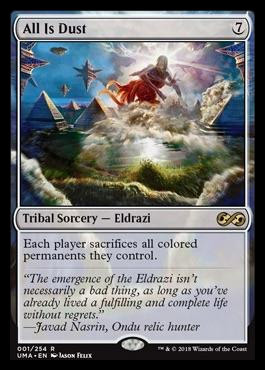 However, being a staple in one of the 5 (I guess 6) possible colors isn’t the same as being a staple that can go in any deck. Despite being in only 33% of eligible decks, you’ll notice something about the raw number of decks for a card like Lightning Greaves. Lightning Greaves is in 1.7 times as many decks as Eternal Witness. true, it’s in a smaller percentage of eligible decks (every single possible deck) but it’s in a greater total number because of course it is. Eternal Witness and Cultivate can’t go in Ayli, Eternal Pilgrim decks and that’s fine, but Lightning Greaves can and does. When you’re evaluating stuff that got a reprint and trying to guess how well it will shrug off that reprint or you’re looking at a new card to determine how many decks it will go in, you should bear in mind that artifacts and lands, provided they don’t have a color identity like Simic Signet or Rugged Prairie, will in general have higher total demand and you can develop a pretty rough formula to “weight” the colors against artifacts to figure out how much of an impact we can rely on. This is not going to be all that precise, but it kind of doesn’t have to be, does it? If we look at cards that are in a given percentage of eligible decks of every color and weight that raw score against the raw score of an artifact that’s in the same percentage of eligible decks (read “all” decks) we can come up with a factor for each color that shows what percentage of format demand each color accounts for and we can make more informed decisions about what to target both when cards are reprinted and when they’re spoiled. 2824.44 decks is 1% of total decks. 1295.35 decks is 1% of all White decks. That means an artifact can have, on average, about 2 times the demand a White card can if they’re in the same percentage of total eligible decks. A White “staple” in 40% of all White decks is still in under half of of the number of decks an Artifact that’s in 40% of all eligible decks. 1420.64 is 1% of all Blue decks. Again, that means artifacts are represented 1.98 to 1 compared to Blue cards. 1433.16 is 1% of all Black decks. That means Artifacts are represented 1.97 times as much. So far, Blue and Black are very close and White is represented less than the other colors – but only by about 1% so it’s not a huge deal. 1276.23 is 1% of all Red decks. Artifacts are represented 2.2 times as much as Red cards if we can rely on this data. 1320.66 is 1% of Green decks. I’ll be honest – I expected Green to be represented more than Black but I’ve been wrong before. Again, we’re talking about a 1% difference so it’s really that we’re seeing artifacts represented twice as much as colored cards, provided they’re played in the same percentage of decks. Basically, an artifact has twice the potential because it can go in more decks. Whether or not these numbers are exact, and there were some discrepancies between the totals depending on which page you looked at, the discrepancies were less than 1% of the total and we’re basically looking qualitatively at this rather than quantitatively. I don’t think it’s important to note that there was a factor of 1.97 for Black cards and 2.2 for Red cards, I think it’s more important to note that the colored cards, no matter the color, accounted for roughly half of the decks and artifacts can go in any deck. 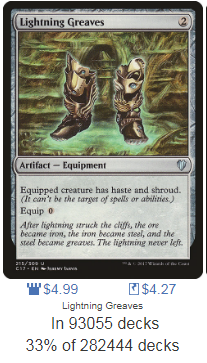 An artifact that looks like a staple like Aetherflux Reservoir can go in twice as many decks as a similar card like Thousand-Year Storm. Sure, they will overlap a lot, but Reservoir can go in Ayli, Oloro and a ton of other decks with no red or Blue that Storm cannot, and that’s important to remember. If I made a colossal error in my calculations by relying on data that was calculated in some goofy way, I think we would have come to some counterintuitive conclusions but considering most decks are two colors, it’s that crazy that decks with any given color would be roughly half the total. There are a lot of five color decks, for example, and a five-color deck outweighs the colorless decks five to 1. Going forward, know that colorless cards (truly colorless ones, not “colored” artifacts like Lifecrafter’s Bestiary). We should take note of that in the future. We expect Eternal Witness to shrug off its reprinting. 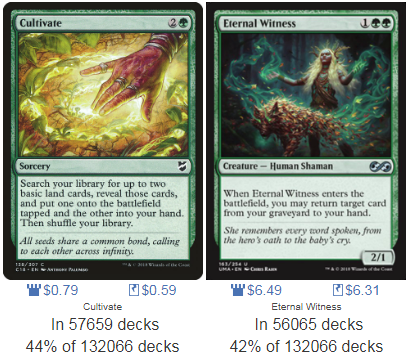 Currently, Eternal Witness is in 56,256 decks which is 42% of all registered Green decks. If a card with those sort of numbers can shrug off repeated reprintings, do we expect other cards to be able to do the same? Let’s look at some artifacts about to be reprinted and see what their numbers look like. A 6,992 decks which is about 2.5% of all decks, I don’t think this has the chops to get back up in price. It was a scarcity-based price, antagonized by repeated failures to reprint it. Eternal Witness is in about 8 times as many decks as this. The good news is this being printed at rare and overlooked by everyone who doesn’t play EDH means this will probably tank very hard. It’s going to recover a bit and that means if you buy at its floor you will make money. It would be a little too simplistic to say this will recover an eighth of its value if Eternal Witness recovers all of its value, but considering this likely tanks to a few bucks, I think an eighth of its peak price of about $64 isn’t too shabby. I don’t have as much faith in this recovering, which is why we looked at numbers. Meanwhile this bad boy is sitting at 23,651 decks which is 8% of all decks. I also think if this price tanks, there will be some discovered demand as a lot of players balked at paying $30 for a mana rock. I think this could be a decent buy when it tanks, and being reprinted at mythic in a very limited set bodes well for its recovery chances. I am much more optimistic about this recovering. 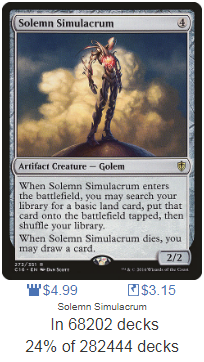 I’ll still buy Phyrexian Altars for days because I want them in most decks, but this seems like a better investment. 9,363 decks, or about 3%, coupled with its play in other formats is nothing to sniff at, but repeated printings and a printing at non-mythic rare make me think this has limited recovery prospects. I’m not as excited about this as I am other cards. 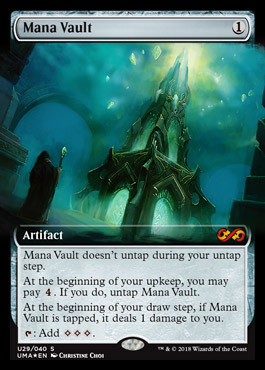 Everything we said about Mana Valut we can say about this, only at its peak, Ancient Tomb hit about $50 which is substantially more than Mana Vault. I think there will be some discovered demand here although we’re talking about a card in roughly 8% of eligible decks, which is a lot, but whose demand is mostly predicated on other formats. 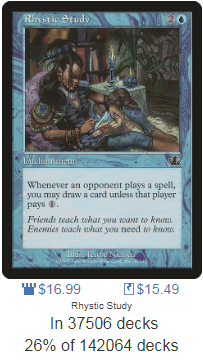 I think non-zero EDH demand, discovered demand from new players eager to snag a copy with it pre-selling for about $24 and liable to go down a bit more as people open more packs means there is a lot of opportunity for this to substantially recover. 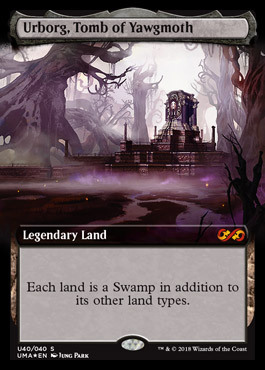 Compare the colorless cards to a “Black” land like Urborg. 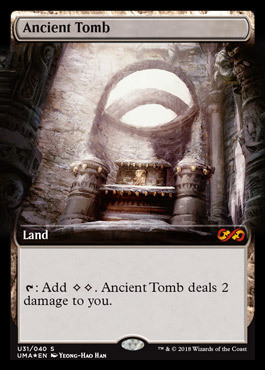 Despite being limited to black decks, Urborg is in 45,200 decks, which is 32% of all Black decks and therefore about 16% of all decks, Urborg is in twice as many decks as Ancient Tomb despite not being a colorless land. Demand based on power level matters, too, but this is more of a gut-check than anything. Sure, we have data to look at when evaluating reprints, but what lessons can we take forward when we look at cards printed for the first time? Colored cards are therefore half as likely to become a staple as an otherwise equivalent artifact or land card. Evaluating this can be tricky because of course it is. This was an interesting data dive and I appreciate you taking the ride with me. If you take exception with any of my methods, let’s get into it in the comments section. Otherwise, have fun drafting Ultimate Masters on Friday! Until next time. Been following your articles since…2013? Probably Top 5. Excellent analysis for a point that was in my head – but it’s really nice to see the data. I don’t have time to sift through like you do anymore – so thanks! This is one of your best Jason. I’ve been reading your articles for 4 years plus and this is among the best. Very good points and data to back it up. Good one. Nice reading of data. Yup yup yup. This is why panharmonicon was the easiest of easy mode pickups for its entire standard lifespan. Aetherflux reservoir, too, kinda. It’s also why speccing on commanders themselves is usually the wrong way to go. 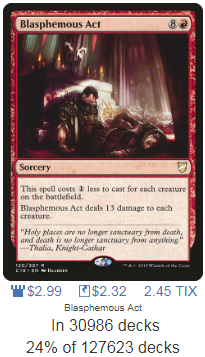 I got semi-burned on Vial Smasher & co.*; I thought “there’s nowhere to reprint this, and it’s popular!” and while those FACTS were correct their IMPLICATION (that they would easily rise in value) was not. They still might perform over a long enough span, but clearly I got in for a little too much money and WAY too early. My new Commander release plan is to pick single-color “new in this year’s commander set” cards to focus on. Like Disrupt Decorum, which I should have gone deeper than 1x on. 😛 I notice all the Kindred cards have made strong gains.